You always know you've hit the "big time" when you tick somebody off. This one comes from an illiterate Bobover who calls himself FICHEUNGER who's upset I gave MD Unger "publicity". posted a link to our story about Bobov/Ponim Chadoshos. The trouble is that he misunderstood the story and wrote that Unger had some "shaichus" to Chabad, when all I meant to write was that he lived in Crown Heights and had a negative experience with some members of the community. So, I commented that the story is incorrect. The obscenities he sent are posted here for "journalistic accuracy and integrity". He says (in uppercase letters) " GO F*** YURSELF."(sic!) (misspelling his). I'm beginning to think that taking a side on this issue is going to be easier than I thought. It's good to be recognized. A reader writes: "Tzig check this out!" SYSCO Pulls License from Veal Producer Over Kosher Slaughter(Brooklyn) Atlantic Veal, a 50-year old Brooklyn-based producer of veal with a slaughterhouse in Ohio, has lost its license to do business with SYSCO, the world s largest foodservice company, after an auditor failed the company because of its kosher production at the plant. Kosher Today has learned that Atlantic had acceded to SYSCO'S request for an audit based on animal welfare standards of the American Meat Institute, which includes the recommendation that head restraints be used in the kosher slaughter of veal. The USDA supervised plant, which occasionally produces kosher and halal meat, uses the hanging method of schechita without the restraints, which a company spokesman says follows the religious dictum for slaughter by the religious authorities supervising the plant. Atlantic received a 100% rating from the auditor until he discovered the kosher slaughter. To the company, the! loss of the estimated $7 million in business is devastating, especially since SYSCO was not buying the kosher production and the kosher processed foods were in full compliance with USDA regulations and religious law. Food sources say that Atlantic is determined to win back the business that it had lost from the large foodservice company. SYSCO - an acronym for Systems and Services Company, reported $29.3 billion in sales in fiscal year 2004. Does anyone else believe that animal-rights groups are working behind the scenes to pressure companies not to do business with slaughterhouses, and this is one way of doing it, or am I just plain paranoid? I've been doing a lot of reading recently, keeping this brain of mine at peak performance, and I've noticed something strange. In the most difficult times Jews had no problem standing up to whatever trials and tribulations they encountered. However, at the first signs of freedom everything basically flew out the window. Case in point: Germany. German Jews, who had it somewhat easy, at least relative to its other European Brethren, jumped at the first opportunity to erase any and all observance of Judaism. It also did not take much. Most of the reformers who instituted the changes were either "Reverends", Hebrew Teachers, and dropouts who were banished from Yeshivos, but they had no trouble "convincing" the masses that what they had kept with Mesiras Nefesh was totally outdated and pointless. By the time Hitler came to power most of German Jewry was already long assimilated, so much so that a Jew 1/16th Jewish was also not "Aryan". In Eastern Europe, it took a little longer, but the result was more of the same, although to a lesser extent. The pogroms and daily encounters with Anti-Semitism did little to diminish their belief in Hashem and his Torah, whereas emancipation, the ability to own property, and being accepted into Universities did. In America it only took one generation, and in some cases, the Tefillin were deposited at the bottom of the Atlantic for the fish to consume. The point of this blurb is not to discuss what it was that kept the observant from being swept away with the tide, but to examine the "cause" of why the tide did sweep away so much with it. In no way do I mean to speak evil of our ancestors, I just wish to know: was it fear of G-d all those centuries, or fear of.....? ...He came last night and would not leave, reliving events as if they were happening right now. Begging of the young to treasure their time and energy whilst they still have it. Names flowing of people and times gone by and never to be seen again, "Zalman Kurenitzer", "Yisroel Neveler", "Shmerel Batumer", and most of all "Di Tatte." Di Tatte was lulled to Lubavitch by a Chossid recognizing his qualities and offering him a once-in-a-lifetime opportunity to see and hear the Rebbe. He had learned with the greatest in Minsk, but was wanting. He had been in the sights of the "enlightened" of his Yeshivah but never succumbed. He lived the rest of his life with the ideals embedded in him by the Rebbe, who had told himחאניע, דו ביסט ביי מיר ווי אן אייגען קינד . In the dark days he did not waver and continued to teach without fear. They came for him one dark night and he was never heard from again. He was shot in 1938, with his son Shmuel killed for him to see, for carrying out the Rebbe's will. The Rebbe would forego trips with his father the Rebbe just so he wouldn't miss their time learning together. He never forgot Chonye and lamented over him for the rest of his days. "Oy, Chonye!" was the cry of the Rebbe upon seeing his son after so many years. It takes a big man to unite most facets of Jews, and not many others can do it. For $2.90 you can watch live video from Meron. You can do the Chai Rotel thing online, too. Oh!, and don't forget to learn a shtikkel Zohar! In case you're wondering, I mean RaSHBI. for him to take their side, but them's the breaks. Something within me tells me not to support the Ungers simply because of his relationship with Lubavitch as a youngster in Crown Heights, something he learned from his father. However, the non-conformist within me has convinced me otherwise. Besides, those shiny Bekishes BZH wears give me the shakes. Leibel Zajac is not one to back down. It doesn't matter who's in his way, he pushes him aside. Recently in Boro Park, my Golus home, I noticed flyers on the street with a "call to arms". It was beneath me to pick one up but I did stoop to read one. It went something like this. In short, don't attend his lectures. My question is as follows: the flyers were obviously about his opposition to Metzitzah B'peh, something that his well known to all Rabbinic Personalities. If so, what gives? Why is he given a free pass, and Rabbi Tendler is hung out to dry? Leibel, however, should be applauded for his honesty and fearlessness, but this is nothing new. "Zelda (Shneurson Mishkowsky) (1916 - 1984, b. Chernigoff, the Ukraine) was born into a famous Chassidic family. His (sic! )father was a rabbi and her mother, devoutly Orthodox, was also well-read in modern Hebrew, Russian, and European literature. They immigrated to Jerusalem in 1926. She studied at a religious school for girls and then at a teacher`s seminary. 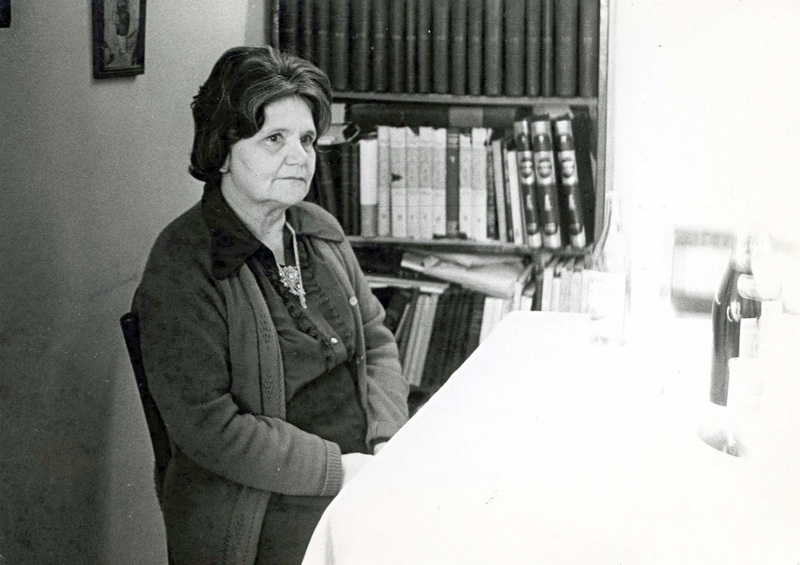 She then studied art and painting in Tel Aviv and later moved to Haifa, where she worked with handicapped children. When her husband died she returned to Jerusalem and taught, retiring after almost 50 years. Known simply as Zelda, she began composing poetry as a teenager but began publishing only in 1968. Awarded the Bialik Prize, she published six volumes during her lifetime before dying of an illness. A complete collection of her work was published posthumously.Acclaimed for her directness, precision and simplicity, and well-loved by the predominantly secular Israeli readership, Zelda`s memory and symbolism are steeped in traditional and Chassidic allusions." It has been posted recently on several blogs, that the golden chain of Chabad and the Rebbeyim has been broken, due to the descendants leaving the fold, at least partially. Of course, like any other Rabbinic family from that far back much can be and has been lost. However, I aim to prove that lack of children is a major factor as well. We'll do this sowly, and from the last generation up. and besides, who am I to defend the "Tsarske Familie"? That year, (1870, HT) there arrived in America, a unique personality, a Jerusalemite, a Judean diplomat without portfolio, who became an American citizen before returning to the Land of Israel. He was Hayyim Zevi Sneersohn, a grand-grandson of Shneor Zalman, Rabbi of Liadi, the founder of Chabad Chasidism. Reb Chayim Tzvi was, according to Loebtree, the great grandson of The Alter Rebbe, and a grandson of HaRaHa"K Reb Moshe N"E. He had immigrated to then-Palestine with his mother in 1840 (aged 8?) and was recognized as a prodigy. By 1860 he was traveling to the Far East and as far as Australia to raise funds for the poor of Israel. In May 1870 he traveled to Cincinnati, where he told audiences that he felt he could discern the finger of G-d pointing to a day "not far distant, he hoped, when the great deliverance would take place and the land [of Israel] be restored to the Jewish people." "He stressed the need to purchase land and erect buildings, because the restoration would not be accomplished just by the word of G-D. He pointed out that Abraham too, bought land, even though it had been divinely promised to him." He had one son, Moshe, no grandchildren are known. He passed away in South Africa in 1881-1882 as a young man, while raising funds for the Needy of Israel. Seems like the two sides couldn't get along even about putting up a headstone, so they made two unveilings yesterday. Did they cover it again after the first time? The Papers had their fun with the story. Chabad always gets involved somehow. Rabbi Ben Tzion Halberstam with Rabbi Levi Azimov of Chabad of South Brunswick, NJ. He would make you believe that Levi Leviev and his evil connections are planning a hostile takeover, ultimately delivering it all to Putin. Here's what he's really up to. Then again maybe this is all part of his evil plan? He speaks of his feelings that were hurt on that YomTov day. "They should have forgone on their silly rules and let me lead". Yet, he thinks very little of the feelings of the public, the ones who preceded him there, and who made him feel comfortable in the first place. Something inside of me feels for him, understands where he's "coming from", but the empathy doesn't last long. It cannot be that an incident that can very easily be explained to any five-year old should have such reprecussions. The handwriting was on the wall for all to see. He wasn't getting "the respect" he deserved, the recognition for his sacrifices, as common as they may be. So, our friend resorts to attacks, personal, hateful, mean and vicious. The targets are very broad, without fear of offending anybody, even those not amongst the living, and maybe because of that. They are the easiest targets, for they cannot defend themselves, so we aim to do the defendin' around here from now on. If you need to ask you're at the wrong blog. I'm totally new to HTML and/or webpage design, so please cut me some slack and bear with me, I'm told it'll be worth the wait. Our goal in creating this here blog is simply to set the record straight. It seems to this blogger that the woodwork has been letting its moles out recently, and he is not happy. No, my friends, he is not. He can understand a need to vent or rant about a current event in a person's life, and far be it from him to deny this need. The problem arises when decisions are made and opinions are formed about subjects, people, and events that they have no business opining about. In other words, people rewriting history in the name of "truth-seeking". Our goal is to challenge them. We have the know-how, and the tools to do this, and with G-d's help, the time will be found as well.